Breath of the Wild was released just over a year ago. It may not feel like it, but many of us have spent over 350 days exploring the vast fields, the towering mountains, the dense forests, and the expansive deserts of the game’s massive world. The latest Zelda adventure was truly something special, providing players a sense of openness and freedom we’ve not seen in the series before. We were free to go where we wanted, whenever we wanted; we were free to take on any challenge, in any order. And in this way, one player’s adventure may end up looking completely different from another’s, as each person’s quest is its own series of unique experiences. Our talented team at Zelda Dungeon recently looked back at our adventures in Breath of the Wild. Much like Link exploring the fallen kingdom to regain his memories, we reflected on our past experiences with the game in order to find one moment that stuck out to us the most. 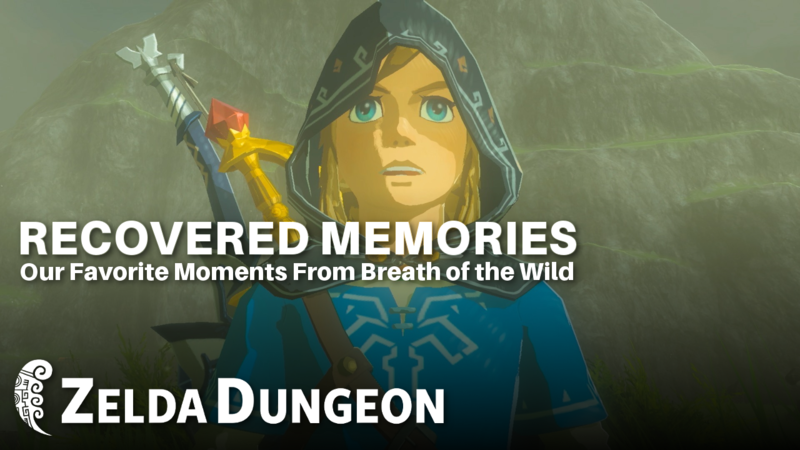 Please join us as we share the memories that defined our past year with Breath of the Wild. I have a lot of fond memories from playing Breath of the Wild. From first exploring the Great Plateau to raiding Hyrule Castle, there were plenty of great moments that I had while playing the game. However, my favorite memory from playing the game is, and always has been, when I killed my first Lynel. I was working toward getting into my first dungeon of the game, Vah Ruta, and part of that quest involves getting a bunch of Shock Arrows from a peak near Zora’s Domain where a Red Lynel lived. I kept trying to get the required number of arrows without being noticed, but time after time, I was seen and promptly killed. I decided that I had had enough of messing around with that thing, so I decided that someway, somehow, I was going to kill it. I’d like to point out that I was very early in the game here, with my highest-damaging weapon dealing somewhere around twenty damage per hit. I was at a massive disadvantage, and I died several dozen times. Each time though, I managed to get better at perfectly dodging and delivering Fury Rushes. Every time I took even a little bit of damage, I’d rapidly open my inventory and eat some sort of food item to get my health back. Eventually, all of my melee weapons broke, and by now, the Lynel’s health was incredibly low. In a fit of desperation, I pulled out one of my bows and began firing arrows at it. After just a few hits, I finally managed to fell the great beast. Triumphantly, I collected the Shock Arrows that I needed, before sidetracking to get more weapons and food. That was one of my favorite moments from playing that incredible game. Easily, the number one memory from my playthrough of Breath of the Wild was right at the start of the game. I had just gotten the Paraglider and went to use it at the top of the Temple of Time. The Nintendo Switch was brand new, so I was still trying to figure out the button placement and controls. Naturally, I jumped off of the Temple of Time and pressed the wrong button, face planting straight into the ground. I have a lot of fond memories of my first playthrough, but the most poignant of these is maybe a little less optimistic. Upon reaching Zora’s Domain and activating the Vah Ruta sidequest, I headed up Ploymous Mountain and was almost instantly killed by the resident Lynel. This process repeated a few times, before I finally gave up. Feeling very defeated, I stumbled my way down the south-eastern edge of the map. It wasn’t a particularly fun time, and I died a lot. It was all very doom and gloom, and I very nearly gave up. But, just when I was about to put the game down, Lurelin Village appeared, like a light at the end of the tunnel. A stunningly beautiful place, the soundtrack of which wasn’t on the CD I’d been playing on repeat for weeks by this point, so it was a complete surprise to find. I chilled there for a little while, and then discovered they sold shock arrows. Who needs to defeat Lynels anyway? My favorite moment from Breath of the Wild was when I booted up the game and started playing it the day it came out. The experience of waking up and exploring the world at my leisure, scouring the Great Plateau for food and resources, fighting enemies, climbing to the top of the ruins at the Temple of Time, all really set the tone and experience for everything else in the game. There are so many other parts of the game that I enjoy (namely the final memory that you can unlock featuring Zelda saving Link; that was an incredible moment), and while the game as a whole is excellent, there was something about those first several hours that really stuck out to me. The sheer joy of playing the game late into the night — on a school night, no less — was so much fun, and that made it the highlight of my journey through Breath of the Wild. Even though it was shown, at least in part, during the E3 presentation, coming across and exploring the ruins of the Temple of Time was my favorite moment. Call me cheesy, but I ended up going into the forest and gathering a whole bunch of apples, nuts, and wood, and then went back into the Temple and laid out my offerings once I had enough orbs to level up. I had Link pray to the statue and got my upgrade. To me, it was a fitting tribute to a series that has given me so much. Early in my playthrough, I decided that nothing could possibly go wrong if I dipped into the Hyrule Field region just to get its tower. With my mission set, I captured a black horse and rode out in the dead of night. I ran straight into a Guardian. And then I bumped into a million more. I ditched my ride and scurried from cover to cover in order to avoid lasers the whole way to, and up, the tower. After I reached the top of the tower, I knew that wanted my horse back. After getting spotted a few times by the watchful Guardians, I had to sneak when tracking the horse down again, hiding in ruins and tall grass. I finally found the steed and rode like hell out of there. But as day broke, I found out that my horse wasn’t black; he was dark brown. I considered ditching him for him a horse of a different color, but I decided that we’d been through too much together. He’s been my main horse since then. I call him Sunder, and we’ve got many stories together. I got super angry when a Lynel killed him, but grew relieved when I found out about the Horse God! One of my favorite moments from my playthrough of Breath of the Wild was when I opened the Qukah Nata Shrine in the jungles of the Faron region. The first Divine Beast I entered was Vah Naboris, but I went in too early, so my heart count was low and I was decimated every time I fought Thunderblight Ganon. I went exploring as a de-stresser and, after a lot of (stress-inducing) climbing around in the rain, I came upon Qukah Nata’s shrine. I got Kass’ song hinting at a way to open the Shrine, but I still wasn’t totally sure what to do. My dad was watching me play and giving me suggestions when it dawned on me to just leave a rusty shield on top of the mound! I was hyped when I finally cracked the puzzle, but I was even more hyped when I got the Rubber Tights inside the Shine. They were just the defense I needed against Thunderblight Ganon’s attacks! What were the odds that I‘d find that shrine exactly when I needed its treasure most? I was thrilled and literally beat Thunderblight Ganon the very next time I fought him. Take that! Honestly, the most memorable thing about Breath of the Wild was when I first got the game and began to explore the land. I literally ran around the Great Plateau for six hours straight, going through each shrine and coming up with fun ways to solve them, exploring every nook and cranny of the region and falling in love with the quiet atmosphere of the game. When I finally got the Paraglider, I was so excited that I jumped off the Great Plateau and forgot to glide, but I didn’t care. A whole new world of exploration opened up for me and I began to befriend lots of horses. I made it my goal to befriend the Royal White Stallion, though I wasn’t aware of the animal’s significance at the time. This game still gives me chills to this day, and will always be one of my favorites to play over and over again. Wandering the world at night, I keenly remember seeing something huge in the distance snaking through the sky, like nothing I’d ever seen in a Zelda title before. It was so far out that I had to take out the Camera Rune to get a closer look and snap a quick picture, like some kind of Hylian anthropologist. It was the fire dragon Dinraal. I know many had their first encounter up close followed by an angelic chorus, but for me, seeing it so far away whilst I traipsed through a marshland felt so real and organic, that this was a world so vast, filled with things I couldn’t imagine and had yet to see. Being slaughtered by a Lynel comes a close second. Getting access to the game in the first place was almost one of my favorite memories. My spouse Andrew and I had been on the road, unable to get home time until just after St. Patrick’s Day. So, needless to say, I was avoiding Zelda Dungeon’s Discord in an attempt to not have the game spoiled for me. I’m like Kakashi from Naruto; spoilers are my weakness. I remember arguing with Andrew as to who got to play the game first, and I honestly pulled the “my job might require me to” card. In any case, my favorite memory from actually playing the game was being able to take my time with it and explore. I also enjoyed sharing the experience with my close friend, as I changed my Switch to Russian for her so she could brush up on the language while she played. Because of that, I can partially read the Russian alphabet, as in, transliterate it. Breath of the Wild came at a time when I needed it in my life. Considering the 300+ hours I put into it, you’d think that I would have multiple moments/memories from Breath of the Wild to talk about. But the one that always comes to mind happened when I encountered an enemy camp in the cliffs of Gerudo Valley. At that time, I was only a few hours in and knew the Red Moblins could pick up any weapon lying on the ground and throw it at me. But in that moment, I discovered that they could throw ANYTHING. When I failed a stealth attempt on the enemy, I got into some serious combat. Then, completely out of the blue during the fight, one of the Red Moblins grabbed a Red Bokoblin and just chucked the dude at me. After dodging the enemy hurdling towards Link, I had to pause and just think about what had just happened. My favorite aspect of Breath of the Wild is the way in which it encourages exploration and, in turn, draws out a sense of awe from the player. My first playthrough in particular took me back to my days of playing Pokémon Snap and discovering how to evolve Charmeleon into Charizard. No part of the game exemplifies that childlike sense of wonder better than my first encounter with Naydra. As I scaled Mount Lanayru, I had no idea that what waited for me at the top was a Malice-corrupted dragon. The boss fight that followed — one that wasn’t even a part of the main quest — was my most pleasant surprise of the whole game, and definitely among my standout memories. There are so many moments in Breath of the Wild that struck me that it’s hard to narrow it down. I guess the one thing that sticks out to me is that in a game filled with powerful moments — Zelda awakening her true power, Link and Mipha sharing a tender moment atop a Divine Beast, Link channeling his inner-Wario to go hog wild on a motorcycle — it’s the little things that stayed in my memory the most. Trudging through the snow in Hebra, snowflakes falling from the night sky, wondering how much further I could go until I hit the end of the map. Zipping through caves and dodging laser blasts from Guardians in the old, wet ruins of the Faron Grasslands, wondering how long these ancient statues had been there. Climbing to the tallest tower in Eldin just to see how long I could float in the air after I jumped, and seeing a majestic red dragon in the distance. Never have I felt so much from doing so little, and honestly, that’s what I remember the most. One year of Breath of the Wild to me also means one year of The Hyrule Compendium series and my time working on ZD’s YouTube channel. I moved just around the same time the game came out. A month prior, my house has been robbed, video game consoles stolen. Getting the opportunity to play Breath of the Wild upon release and making discussion videos about the game along the way dispersed the terrible feelings from having my home broken into. One of my favorite concepts in the Legend of Zelda series as a whole is the timeline. While I’m not a fan of real world history, I wouldn’t blink an eye deciding to spend an afternoon delving into the Hyrule Historia. When Breath of the Wild was initially released, I immediately began deciphering where in the timeline this game would fit. While on this mission, I remember the exact moments I stumbled upon the remains of locations I frequently visited in Ocarina of Time. The Temple of Time in ruins, Zora’s Domain suffering depression and distrust — I even had to hold back a few tears when my horse and I stumbled upon an abandoned Lon Lon Ranch. Not only is Breath of the Wild a vast and endless game, but with it comes a surge of nostalgia. Ocarina of Time was the first big video game I ever played, and it holds priceless memories I shared with my parents as a six year old. Now, nearly twenty years later, all of those accomplishments came rushing back to me. I love the endless opportunities Breath of the Wild creates for old and new fans alike to connect and share their adventures of Hyrule. There’s no doubt that, for me, the best moment from Breath of the Wild is not necessarily one moment alone, but rather the whole experience of roaming around Hyrule looking for stuff to do. When I first got the Paraglider and was given real freedom in the game, I just went nuts (and died a lot in the process; I’m not going to lie) trying to explore everything and take in the marvel that is this Breath of the Wild. For the first time in 30 years, no one was telling me where to go and what to do (I’m looking at you, Navi), or constantly reminding me of the battery consumption (yeah, you too, Fi), giving me the freedom I wanted to do things at my own pace and in whichever order I wanted. That, for me, was the pinnacle of my whole experience with Breath of the Wild. Listen, I already know I’m going to be in the minority with this, but my favorite memory from Breath of the Wild over the last year was traversing the entirety of Hyrule in search for all 900 damn Korok Seeds. For me, it wasn’t about that awful excuse for a reward you get from Hestu once you’ve collected them all. It was all about getting to explore every single nook and cranny of this vast, magnificent world that was basically 30 years in the making. I learned so much about this game, things I had no idea you could do or find in between each suspiciously placed rock. I know that’s the way Nintendo intended it. You can’t scatter 900 Korok Seeds on the maps of games like Skyrim or Ocarina of Time and have the same result. When it was all said and done — because along with collecting all 900 seeds, you naturally have easy access to collect everything else as well — my absolute favorite moment was collecting that final seed, and seeing that 100% on the completion counter on the corner of the map, as well as my final Hero’s Path that got me there. Early in my journey across Hyrule, I began to hear murmurs of the so-called “Lord of the Mountain,” a mysterious entity that resides at the peak of Satori Mountain. Some travelers only dream of seeing this mystical spirit, so I set out to scale to the top of Satori in hopes of catching a glimpse of it for myself. My trek up the mountain was an adventure in itself; I found an unnatural bounty of fruit growing in those foothills, I battled a fearsome Stalnox under the light of a full moon, and I found a Forest Dweller’s Spear in a long-forgotten campsite. This hollowed mountain had a history, and every step toward its peak revealed more of that story to me. When I reached the top, I discovered a beautiful grove under the shade of a cherry blossom tree. Despite being taken aback by the grove’s pristine beauty in the light of the midday sun, disappointment hit me as I searched in vain for the fabled Lord of the Mountain. The Lord was nowhere to be found, so I turned back and descended from the mountaintop. It was only after several more hours of adventure that I noticed, in the misty distance of a night-filled sky, a mysterious blue light emanating from Satori Mountain. In that instance, I warped to the Shrine nearest the mountaintop, and slowly approached the grove I had discovered before. A mysterious aura now enveloped the area, as an otherworldly presence could be sensed just beyond my perception. As my head poked out from around a corner, I saw it, the Lord of the Mountain surrounded by a congregation of bashful Blupees. I knew that I could stay in my hiding place and observe the creature from a distance, but I couldn’t resist getting closer. I stealthily tiptoed behind the cherry blossom tree, now bathed in blue moonlight, and got close to the mountain spirit. I knew the Lord had yet to notice my advances, but I couldn’t help but feel something inviting me to mount the mystic steed. Compelled, I took my chance. The Lord of the Mountain resisted, as expected, but the struggle felt more like an honest test of my resilience than a rebuke. After I proved to the creature that I meant it no harm, it conceded and finally calmed down. I felt a spiritual oneness in that moment, not just with the mountain’s lord but with all of nature. The essence of the natural world had accepted me as a passenger, and I happily accepted. The Lord of the Mountain and I rode across the fields of Hyrule together, racing through the moonlit hills at a feverish pace. But the stillness of the grove at the peak of Satori remained; I saw the world through a lens of tranquility. Our journey together reached its end at the crest of a hill overlooking a field to the east. The rays of the new day’s sun were beginning to emerge, and I knew that I had to let the spirit return to its domain. I dismounted and looked at the Lord’s face. I knew in that moment that I could not let the Lord of the Mountain leave without me expressing my thankfulness for an unforgettable evening. I pulled a shiny apple from my pack and set it at the spirit’s feet. It happily partook of my offering, raised its head, looked onward, and set out into the distance, fading away as quickly as a mirage in the Gerudo Desert. It may all seem like dream now, but I’ll never forget my night with the Lord of Satori Mountain. So there you have it: the memories, moments, and takeaways from our year with Breath of the Wild. In reading through the team’s tales and anecdotes, I’m blown away by how varied our experiences were, and how the game had touched each person differently. I had no idea some of these things could even happen in Breath‘s world. A game that allows for so many different and unique experiences is truly something special. Every playthrough its own story. Did you relate to any of the experiences we discussed above? Is there something from your playthrough that no one else has seen or done?Share your favorite Breath of the Wild memories, moments, and stories with us in the comments below.